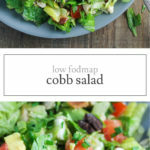 Filled with fresh flavors, this quick and easy Low FODMAP Cobb Salad recipe is perfect for a satisfying lunch entree or side salad. I LOVE salads, but only if they have a lot of stuff to fill me up! 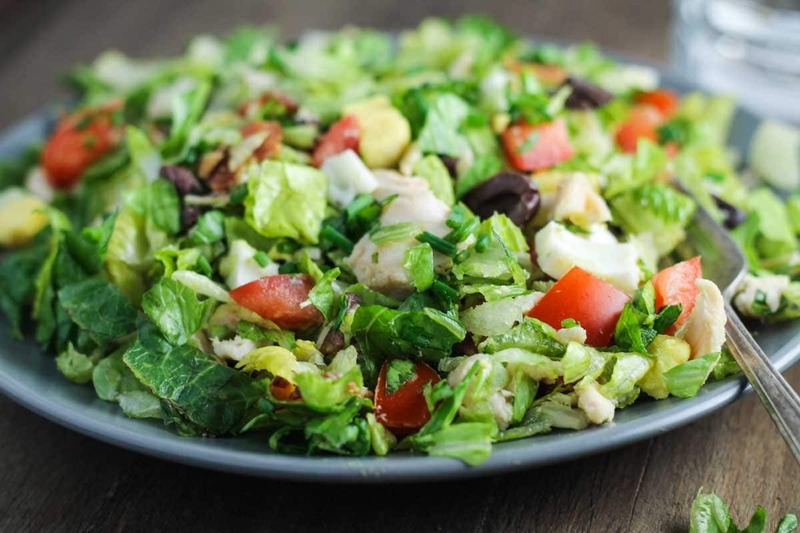 Naturally, cobbs are a fave, simply because they are packed with a whole bunch of flavorful ingredients and this low FODMAP Cobb Salad is no exception! Typical cobbs include Roquefort or blue cheese, but because dairy is no bueno for me (and lots of other low FODMAP folks), I substitute kalamata olives for a similar brininess (or in my husband’s words “stank”). Know what else I love? This salad! Go try it. You won’t regret it! Filled with fresh flavors, this quick and easy low FODMAP cobb salad is perfect for a satisfying lunch. 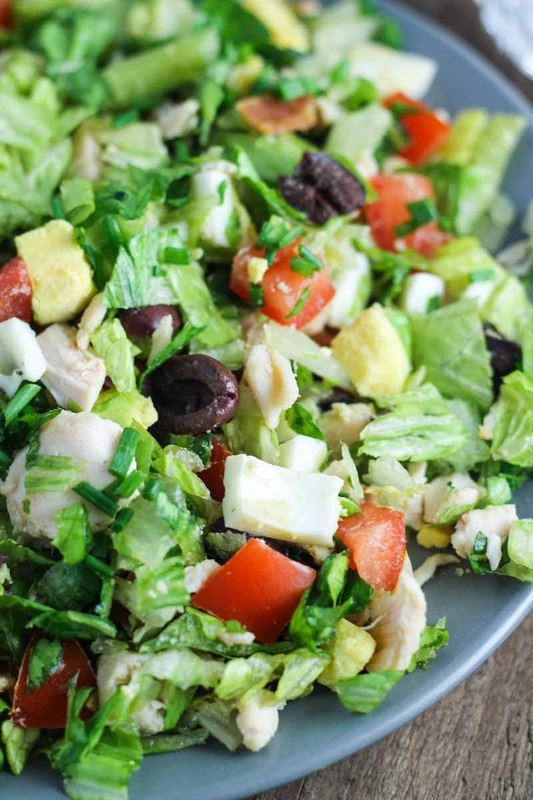 In a large bowl, toss together all salad ingredients, until well mixed. Whisk vinaigrette ingredients and season, to taste. 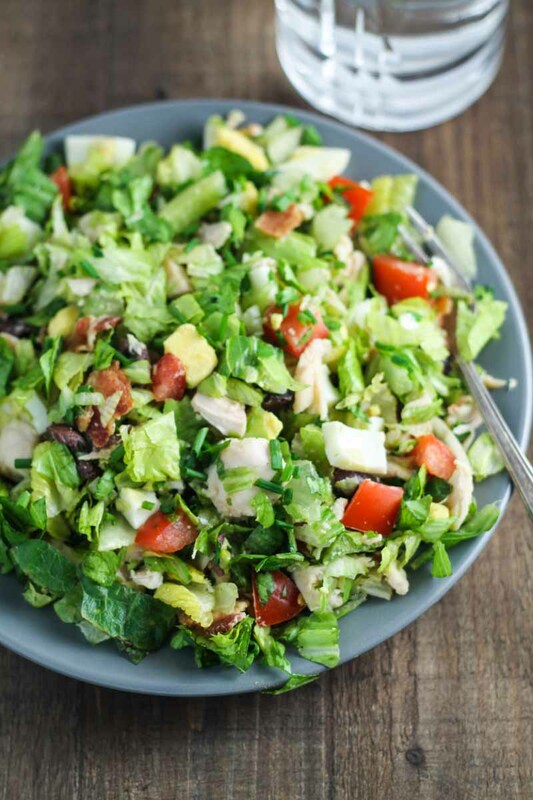 Toss salad with vinaigrette and enjoy! Make ahead? Prepare and store salad and vinaigrette separately. Toss right before serving. I could cry. Thank God I found you, and thank you for all these outstanding recipes!! After a really rough 5 months of suffering and seemingly endless testing, my 14 year old daughter has been diagnosed with IBS. We have really struggled finding foods that she can tolerate. We are beginning the low FODMAP foods today, and what a blessing to find your recipes!! Thank you and God bless you! Hi Jody! Thank YOU for all of the kind words. I am so sorry that you and your daughter have had to go through all of this, but I hope now that that she received a diagnosis, she can finally start to feel better! Please let me know if there is anything I can do to help make this journey a little easier. 🙂 Sending lots and lots of well wishes your (and your daughter’s) way!